These free video lessons with examples and solutions help Algebra students learn how to solve quadratic-inequalities. In these lessons, we will look at solving quadratic inequalities. Step 3: Find the range of values of x which satisfies the inequality. 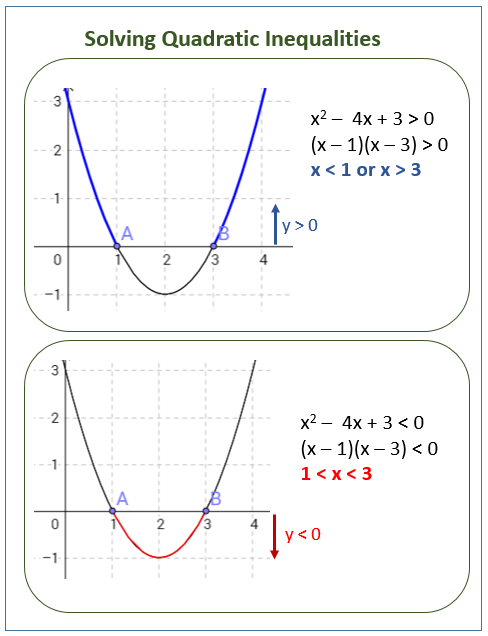 (x – 3)(x – 1) > 0 (y is positive): we choose the interval for which the curve is above the x-axis. The following graphs show the solutions for x2 – 4x + 3 > 0 and x2 – 4x + 3 < 0. Scroll down the page for more examples and solutions. (2x + 1)(x – 5) < 0 (y is negative): we choose the interval for which the curve is below the x-axis. How to solve quadratic inequalities? 1. Find all the zeros of the polynomial, and arrange the zeros in increasing order. The zeros are called its critical numbers. 2. Plot those numbers on the number line as open or closed points based upon the original inequality symbol. 3. Choose a test value in each interval to see if the interval satisfies the inequality or not. If the test value produces a true statement, the entire interval will be true. If the interval produces a false statement, the entire interval is false. 4. Clearly graph your solution and state the solution using interval notation or inequalities. How to solve a Quadratic Inequality? 1) Turn inequality into an equation. 3) Make a number line, and check each solution and interval.